Every time I make a sock bunny, I fall in love. They're just adorable... and this no-sew bunny craft tutorial makes it easy enough for anyone to spread some bunny craft loves. 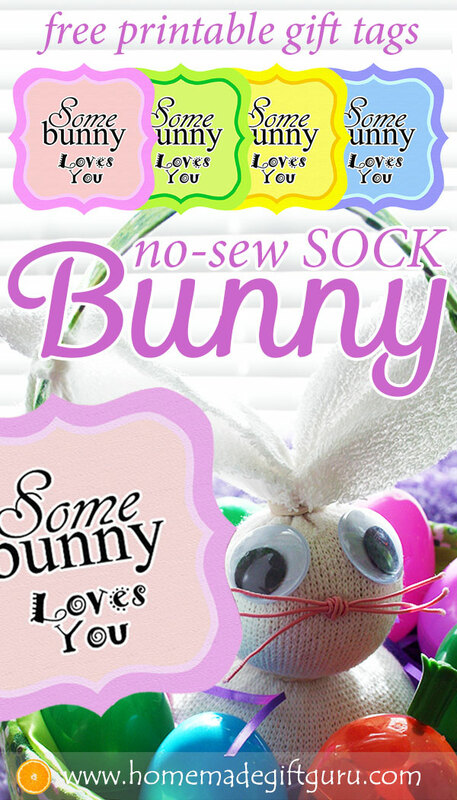 Below you'll find instructions for making your own easy no-sew sock bunny. 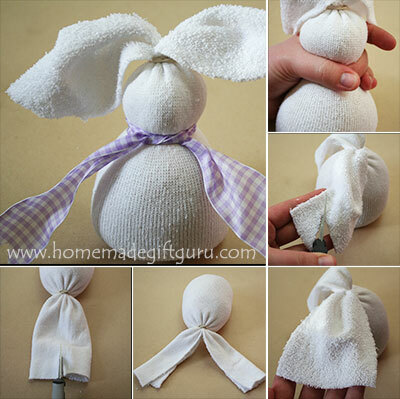 I will also show you how to make floppy bunny feet and bunny arms that can be used to hold little Easter gifts like a flower, candy, or even a balloon. 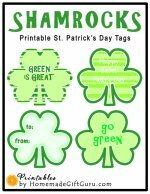 Don't forget to download the coordinating "Somebunny Loves You" Easter printables linked to below. 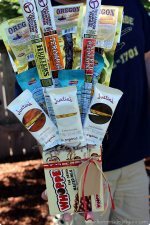 When you're all done, you can put your homemade sock bunnies in Easter baskets and surround them with treats for a fun homemade gift idea. This sock craft tutorial uses an adult size tube sock, but you can use pretty much any size or type of sock for this sock craft. For example, I love making baby bunnies using baby socks. They're super cute and they fit inside most large plastic Easter eggs for a fun surprise. In addition to tube socks, you can make these using colored socks, fuzzy socks and/or socks with patterns. Just like sock snowmen and sock spiders, no two sock bunnies will ever turn out exactly the same! Decorative Craft Supplies: googly eyes, buttons, ribbon etc. Optional: Click here to download the complimentary "Somebunny Loves You" Easter printables in easy .pdf format. 1. 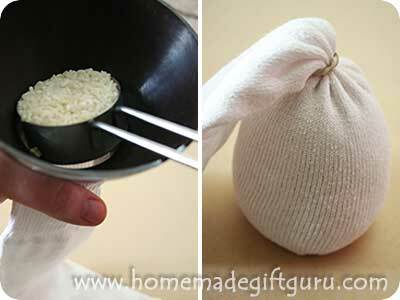 Fill sock with around 2 cups of rice. 2. Wrap rubber band around the top of the sock so you have a ball. 4. Cut that length in half vertically to create two strips coming off the ball. 5. Take each strip and trim off the corners creating a leaf like shape for each ear. 6. Grip the ball where you think the neck should be and squeeze until you have a nice looking bunny head and bunny body. Take a rubber band and wrap it semi-snugly around the neck... not too tight unless you want your sock bunny to have a wobbly bobble head (too loose will allow rice to escape the head). 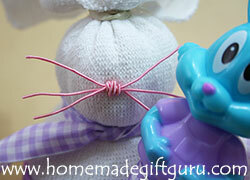 Note: You can cover up the rubber band when you decorate by using ribbon for a bow or fabric for a scarf. 7. Now it's time to make the bunny face using buttons, googly eyes, markers, beads, thread, wire etc. Tip: Memory wire makes a cute nose with whiskers. I like to wrap one piece around three pieces several times as shown to the right. ...You can also do something similar with embroidery thread picked apart into strands. Use your imagination, making the face is the coolest part! 8. Cut bunny paws and bunny arms from something like craft foam or felt. Make the arms longer than needed at first because you will trim the extra length later. 9. Glue bunny feet in place. Put the treat or flowers in place and the arms over it to see how tight you need to glue the arms. I hold everything together and hot glue each of the arms to the sides to ensure a tight fit. 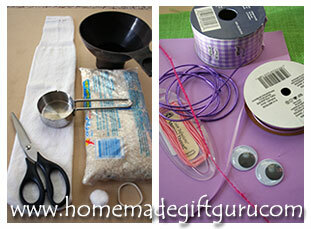 Tip: A hot glue gun really works best for adhering stuff to socks. ...Now go on and make somebunny's Easter super hoppy by giving this sock bunny in a basket and/or holding a treat, flowers or a Happy Easter balloon. 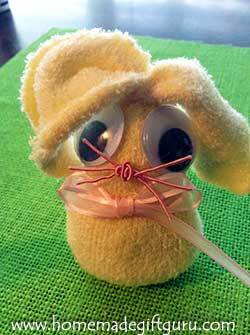 That's how to make a super easy bunny from a sock! 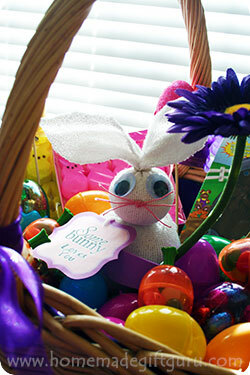 Snuggle your homemade bunny inside a small basket and surround it with a ring of candy-filled plastic Easter eggs. Snuggle your homemade rabbit inside a large basket and surround it with traditional Easter gifts like chocolate bunnies, Spring activities, Peeps, Easter eggs, candy, Easter decor, hair bows and hair flowers etc. 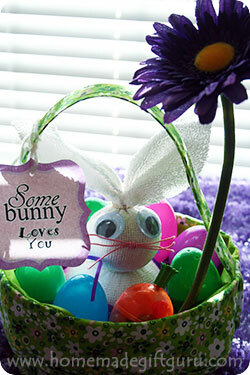 Give it by itself with the "Somebunny Love You" Easter gift tag featured under supplies. Put something in this bunny's arms... You can snuggle in just about any decorative candy tube and/or a festive little balloon or you can stick a giant silk daisy in it's cute little arms (or fresh flowers of course). ...Depending on how you glue on the arms, you can also design your sock rabbit to hold a small chocolate, a candy bar... even a bag of jelly beans. 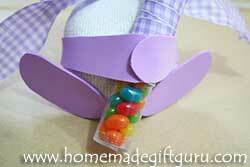 You can also make a DIY Sock Bunny Kit! 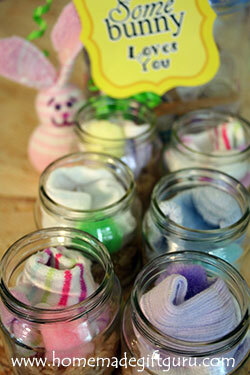 Learn how to make individual one-bunny kits using baby food jars... or make a kit with materials for several sock bunnies (to give to a family for example). 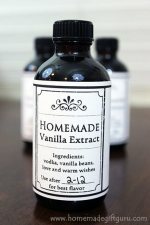 Printable tags with instructions included. 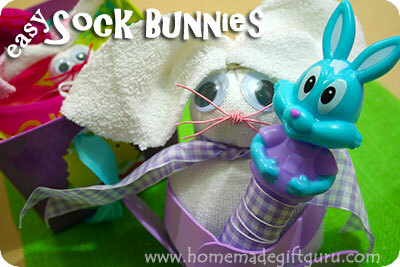 These adorable baby sock bunnies fit inside an Easter egg! 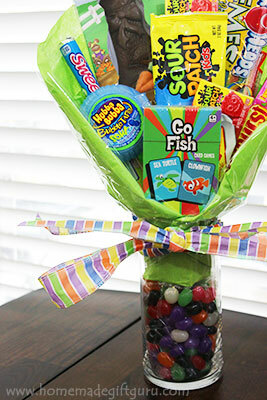 DIY Easter candy bouquets are so fun and SWEET!